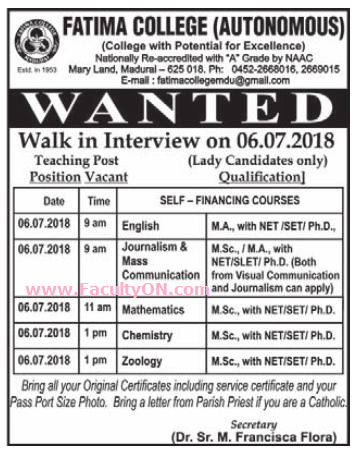 Fatima College, Madurai has advertised in the DINAMALAR newspaper for recruitment of Teaching Faculty- Assistant Professor jobs vacancies. Interested and eligible job aspirants are requested to walk-in on 06th July 2018. Check out further more details below. About College: Fatima College, Madurai, is a women's general degree college located in Madurai, Tamil Nadu. It was established in the year 1953. The college is affiliated with Madurai Kamaraj University. How to Apply: Interested candidates are required to bring all original certificates including service certificates and recent PP size photos to attend the Walk-in interview at the walk-in address given below. Bring a letter from Parish Priest if you are a Catholic.